According to the Dialogues of Pope Gregory I, St Herculanus was buried “in Ecclesia beati Petri apostoli” after his execution by Totila in 549, at the end of the siege of Perugia. According to a hagiographic tradition that probably developed over the 12th and 13th centuries, Bishop Rogerio translated theses relics to “ecclesesia beati Laurencij” (the original Duomo). According to local historians, this bishop was documented in 936. The legend of St Peter Abbot (see below) mentions that “nonnulli dicunt” (some say) that the original church of San Pietro had previously been the seat of the bishops of Perugia. This tradition probably arose because the citizens of Perugia had chosen to bury St Herculanus here. However, modern scholars do not regard this as evidence that San Pietro was ever the Duomo of Perugia. ✴some scholars believe that the fabric of the nave of the present church itself dates to the 6th century. According to a hagiographic tradition that cannot be traced back before the 15th century, Bishop Honestus gave the site of the old church of San Pietro to St Peter Abbot, who came from a noble family from Agello (on Lake Trasimeno). A later version of the legend identifies this as the Vincioli family, who were counts of Agello in the 17th century. An inscription in the first cloister records that St Peter Abbot established a Benedictine monastery here in 964 and that Pope John XIII re-consecrated its church in 969. Although both of these dates seem to have been inserted into the traditions of the abbey in the 17th century, they are broadly consistent with other information about the abbey (see below). ✴Later versions of the legend say that he died in 1007, after 40 years as abbot. ✴However, the abbot who was involved in the dispute with Bishop Conone (see below) in 1002 was unnamed, which would be odd if this post still belonged to St Peter Abbot. ✴An abbot named Peter was documented in 1022, although this was almost certainly a successor of the same name. ✴St Peter Abbot was named as the founder of the abbey in the privilege issued by the Emperor Conrad II in 1027 (see below), by which time he was certainly dead. The first record of the new abbey in the archives of San Pietro dates to 1002, when Pope Sylvester II was called on to arbitrate in a dispute between Bishop Conone of Perugia and the (unnamed) abbot of San Pietro over whether or not the abbey was subject to episcopal control. Sylvester II ruled in favour of the abbot on the basis that two of his predecessors, one named Gregory and one named John, had recognised the claimed immunity: the identity of “John” is discussed below: “Gregory was almost certainly Pope Gregory V (996-9). Sylvester II therefore took the abbey under papal protection. (The authenticity of this document is sometimes called into question, but even if this is correct, it was probably written in the 11th century. Even if the monks misrepresented the precise findings of Sylvestor II, they are unlikely to have invented the dispute between Bishop Conone and the abbey since it had happened in the recent past). More securely authentic is the document of 1027 in which the Emperor Conrad II reconfirmed the privileges of San Pietro at the request of Pope John XIX. This mentions that the founder of the abbey was named Peter, and also that it had received privileges from the Emperor Otto II (died 983). This has prompted some scholars to argue that the “John” mentioned by Sylvester II must have been Pope John XIII (965-72), since an imperial privilege is unlikely to have been granted ab initio. (The inscription mentioned above makes this assumption). The redoubtable Abbot Bonizone (1036-63) came into conflict with Bishop Andrea almost immediately after his appointment. In 1036, he protested to Pope Benedict IX that Bishop Andrea was interfering in the management of San Costanzo, which was documented in 1027 as a possession of San Pietro. As part of his ruling in favour of Bonizone, Benedict IX pointed out that Bishop Andrea had already assured him privately of the independence of San Pietro (and that of two other monasteries, San Salvatore di Monte Acuto and Santa Maria di Valdiponte), and he asked him to renew this promise in public. Bonizone later secured papal reconfirmation of the privileges of the abbey in a series of documents that begins in 1045 with Pope Gregory VI: the Emperor Henry III confirmed these privileges two years later. Pope Nicholas II stayed at San Pietro during his journey to Rome after his election to the papacy in 1059, accompanied by the future St Peter Damian, Cardinal Humbert of Silva Candida and Hildebrand (the future Pope Gregory VII). In 1063, Pope Alexander II announced in a letter to the monks and citizens of Perugia that, following the "importunis precibus" (insistent requests) of Bonizone, he had agreed to accept his resignation and his succession by his son Raniero. Bonizone seems to have died two years later. A list of the possessions of the abbey contained in a privilege issued by Pope Eugenius III in 1145 included a hospice “ante portam Sancti Petri” (outside Porta Marzia, the gate in the Etruscan walls that was then known as Porta San Pietro). However, in the case of the hospice (see the page on Santa Croce), Eugenius III added the caveat “salvo jure dominici Sepulchri” (without prejudice to the rights of the Canons of the Holy Sepulchre). In ca. 1150, Eugenius III revoked this part of the privilege and recognised the Canons of the Holy Sepulchre as the rightful owners of the complex. It seems that the privilege of 1145 had been based on an earlier privilege of Pope Callistus II (in ca. 1120) that was now judged to be a forgery. Thus, the Canons of the Holy Sepulchre, who had presumably founded the hospice, succeeded in defeating the predations of the monks of San Pietro. ✴his son, the Emperor Henry VI, confirmed these possessions in 1196. ✴Pope Gregory IX instituted a reform of the community in ca. 1235 and reconfirmed its privilege of papal protection. ✴Pope Urban IV lived here during his sojourn in Perugia and died here in 1264. Pope Clement V gave the abbey “in commendam” to Cardinal Giacomo Colonna in 1306 because the monks could not agree on the election of a new abbot. Cardinal Colonna administered it through intermediaries until 1310, when Ugolino Guelfone emerged as abbot. He relinquished this post in 1330 to become bishop of Perugia. His successor, Ugolino di Nuccio da Montevibiano presided over another period of prosperity. He improved both the administration of the abbey estate and the education of the monks, enlarging and improving its library and encouraging the monks to attend the Studium. He was buried in the church in 1357: his tombstone survives, embedded in the wall at the end of the left aisle (see the page on the church interior). Pope Boniface IX stayed at San Pietro in 1393, and he was probably aware of (or perhaps even a party to) the plan of Abbot Francesco Guidalotti to murder Biordo Michelotti in 1398. 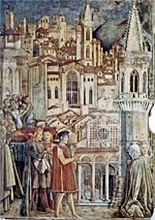 The furious citizens of Perugia attacked the abbey and tried to burn it down. From this point, its fortunes went into decline. The abbey owned a small parish church that had stood near the eastern arch of the Due Porte (subsequently in the inner face of Porta San Pietro) from at least 1285. The church was annexed to the nearby Ospedale di San Giacomo (1394) as its chapel (the Cappella di San Giacomo) in ca. 1400, at which point the complex passed to the Collegio del Cambio. Pope Eugenius IV ordered the transfer of the abbey to the Cassinese Congregation, a reformed Benedictine congregation, in 1436. From this point, it had an prior rather than an abbot, and he was responsible to the head of the congregation, the Abbot of Santa Giustina in Padua. ✴Pope Paul III in 1535 and again in 1538 (just two years before the famous rebellion). ✴and Santa Margherita (in 1561). Following a decision taken at the Chapter General of the Cassinese Congregation in 1702 that Pope Clement XI ratified in the following year, all of these nunneries reverted to episcopal control. The French suppressed the abbey in 1797, but it was restored to the monks in [when]. Despite their traditional papal allegiance, the monks sided with the city in the anti-papal rebellion of 1859 and gave succour to those who fled the massacre outside the abbey. They were rewarded by exemption from the religious suppressions that followed, which accounts for the relatively large number of works of art that remain in the church. Despite this reprieve, the fortunes of the abbey soon deteriorated. The last abbot, Manari died in 1890, and the Fondazione per l' Istruzione Agraria (the faculty of Agriculture of the University of Perugia) took over the complex in 1897. It now operates from the adjacent monastery and tends the interesting monastery garden (see the walk around the abbey grounds).